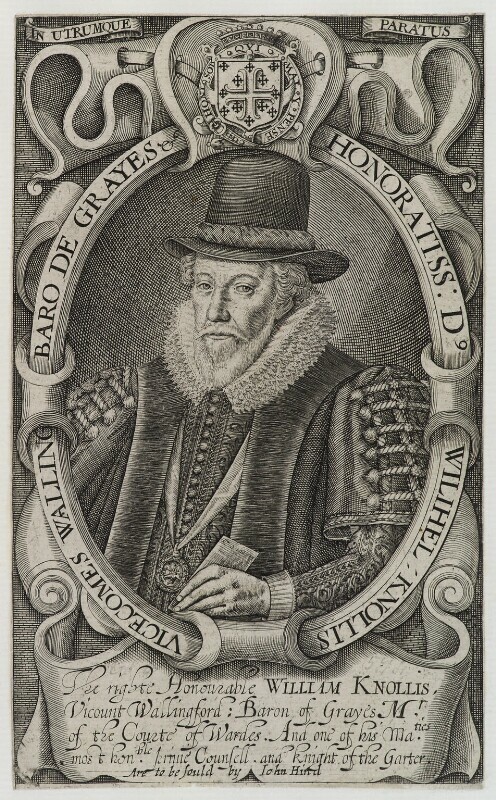 William Knollys, Earl of Banbury (1547-1632), Statesman. Sitter in 7 portraits. John Hinde. Artist associated with 8 portraits. The beginning of a severe economic depression in England is widely blamed on the East India Company whose export of bullion on each voyage financed their trade. Additionally, despite efforts by Lionel Cranfield, Earl of Middlesex, to reduce the royal household's expenditure, James I's debt is historically high. Francis Bacon publishes his major philosophical work Novum Organum, which presents his account of the correct method of acquiring natural knowledge using inductive reasoning. Inventor and mechanical engineer, Cornelis Drebbel builds an early type of submarine which he demonstrates on the Thames. The Catholic League's invasion of Bohemia and victory at the battle of the White Mountain, forces Frederick V, king of Bohemia and his family into exile in the Hague, after less than a year reigning. The Pilgrim Fathers sail for America in the 'Mayflower', escaping religious persecution in England.